Understanding your fabric makes working with it a lot easier and comfortable. 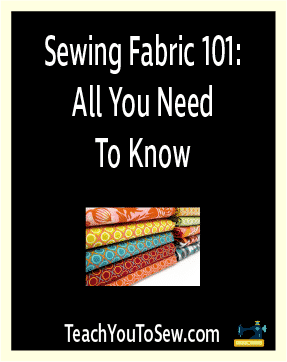 If you’re a beginner, having some knowledge about the different types of fabric and what they exactly offer can help you get sewing considerably faster. Of course, it’s also always a good idea to be sure about what you’re buying and whether you really need it. So let’s take you on a virtual tour of the fabric “store,” a place where you find all the different types of fabric carefully organized in different rows. When you walk into a fabric store, you will find rows and rows of some very pretty and some rather plain fabric. However, the most common type of fabric is going to be your basic cotton, which is also known as Calico in the sewing world. You would see the fabrics arranged by color, making it easier for anyone looking for a particular color to find it quickly. As far as the designs are concerned, they range from small pretty flowers to bold and large dots all over the fabric. Similarly, there are also going to be many bold-colored plain fabric with no design or prints. The styles, too, vary quite a bit. You would find a baby section, then a designer fabric section, a seasonal fabric section, and many more. These fabrics are great for making a variety of stuff, such as bags, quilts, blankets and aprons. Unless you’re someone with specific sewing needs, most of your fabric stock will likely consist of these fabrics. Then there are also going to be something known as “specialty” fabrics, designed for special occasions or fancy dresses. And for making home related stuff, you would have home décor fabrics; they are very large and are rich and attractive in design. What to Look for When Buying Fabric? Well, now that you know pretty much everything about the fabrics you’re going to find in a store or online, let’s talk about the things you need to keep in mind during your fabric-shopping session. First of all, consider the information mentioned at the end of the bolt when shopping for a particular fabric. It would tell you important details like the width and type of the fabric, as well as the pricing and suitable washing practices. Typically, fabrics are 44” inch wide, but some are also 60”. However, the most important thing to do when shopping for a fabric is going to be to study the pattern envelope. It gives you a lot of information about whether or not the fabric is suitable for making your desired type of items. In fact, it’s actually going to work as a guide for choosing the right fabric, and if it does share enough information, you may not have to bother trying to find more information. It will usually give you suggestions about the pattern design it’s designed for, and you ideally wouldn’t want to use it for other pattern designs. However, once you find a fabric that’s the “suggested” option for your pattern design, you don’t necessarily need to choose that fabric. You can instead also find other fabrics with a similar weight and drape, and they are likely to turn out to be just as good an option. But there’s a kind of exception to this. It’s precisely when you’re suggested sturdier fabrics like sateen, faille or poplin, as you would likely not be able to find similar fabrics for that particular pattern design. So you will want to stick to the “suggested” ones in that case. Similarly, fabrics like georgette or chiffon are known for their sheerness are lightweight, and can only be replaced with something that’s just as lightweight and drapes well too. Finally, there are also something known as knit-focused patterns, and they usually call for knit fabrics. Nothing other than those fabrics is going to work for them, as those type of garments are very stretchable so anything woven is not going to be an option for such a pattern type. Once you have chosen your fabric, you need to take it to the cutting counter and tell them how much fabric you need. You would ideally want to figure this out beforehand. Something to note here is that the smallest available length would likely be 1/8th of a yard. If you’re looking for simple, clear suggestions, all you need to do is check out our detailed fabric buying guides at the end of this article. Shopping online for fabric is a simpler and very straightforward process. There are no stacks of fabric to confuse you and making it time-consuming to find what you’re looking for. You can simply use the search bar to find what you want, click on the product, read the description, select the size from the drop down menu, and simply go ahead and place an order. And you wouldn’t have to dig through coupon sites to find coupons as well, as any discounts available at the online store will be shared on their website itself. We recommend purchasing your fabric at Amazon.com or Fabric.com. They have the widest selection of affordable, quality fabric. After getting familiar with the fabric-shopping process, let’s quickly walk you through the different types of fabrics out there. Pure cotton fabrics are very versatile and used for a huge variety of sewing projects. They also tend to shrink and come pre-washed. Given that they are the most commonly used fabric, you can find a whole lot of styles and designs, including expensive designer fabrics with catchy, bold prints, as well as baby fabrics, seasonal fabrics, quilting fabrics and many more. As mentioned above, they are used for making a wide range of things, with quilts, aprons and bags being a few of them. These include fabrics like denim, duck and canvas, and they are considerably thicker and sturdier than your typical cotton fabrics. This means that are much more durable, and hence a great option for anything that’s going to subjected to more rough use than the usual everyday stuff; or could do with being a little heavier, such as outdoor stuff. Some good examples include tote bags and throw pillows, but anything outdoorsy and things that need to be on the heavier side would require employing one of these fabrics. These include fabrics like minky and fleece. They are known for their coziness and softness, making them a perfect option for baby stuff, blankets and pajamas, among many other items. On the downside, they tend to develop some not-so-desireable fluff once they are subjected to regular washing, and are also considerably more expensive. They also call for a more careful sewing work, especially when compared to other typical fabrics. However, when it comes to things like blankets, baby stuff, pajamas and pretty much everything that needs to be a little snuggly, you can’t go wrong with plush fabrics. Flannel is basically a type of fabric with many different types of prints, particularly including baby prints. They are not as thick and sturdy as some other types of fabrics such as fleece, but are instead more like the basic cotton fabrics that we discussed above. Something unique about the flannel fabric is that one of its sides is softer than the other, and it has a snuggly feel overall. However, just like the plush fabrics, flannel too would pill and shrink on washing. Flannel is believed to be one of the best options when you’re trying to make things that need to be both soft and lightweight. As the name suggests, these fabrics are specifically made for making special sewing products, and include things like tulle, satin and silks. Many of these fabrics are very soft, slippery and silky, which makes them an excellent choice for anything fancy or special dresses. Make sure you have your dress form handy! That said, the trade-off is that they are very challenging to work with, particularly due to being slippery. This means that you will likely have to spend quite a bit of time working on them until you’re able to do it properly. Make sure you have the right sewing essentials for the job! They come with the kind of softness that some of the other fabrics we discussed above do, but they are different in the way that they are also stretchy – almost like a t-shirt. This makes them a little difficult to sew on, but nothing that you can’t manage with a bit of practice and a good sewing machine. Another thing to note about jersey knits is that they are also wider than other typical fabrics, so you will most likely need less of them, They are ideal for things like shirts and other similar types of clothing. The large, beautiful rolls of fabric that you see carefully placed in a separate section of a store are likely home décor fabrics. They are very durable and attractive, which also means that they are more expensive. However, they tend to last way longer than other fabrics and are good at restricting the light from getting through them. If you’re looking to make rugs, pillows or curtains, home décor fabrics are probably your best bet. Deck out your sewing room with these great fabrics! Click here to get more sewing help!